Race tire technology during the past several years has made substantial improvements. In the past people had to make much greater performance sacrifices if they wanted a race tire that would last long (for a non spec tire class). Back then, the fastest tires would only last a few sessions before one would see a fairly significant drop in performance. Beyond that, many of the fast tires were less forgiving for a novice to handle and it wasn’t all that difficult to ruin the tire by flat spotting it under braking. (Flat spotting is a term used when one locks the racecar’s brakes, and skids a bit thus causing a flat spot on the tire.) The great news is with these advancements, you can use a race tire that is both fast and fairly forgiving without having to sacrifice performance. 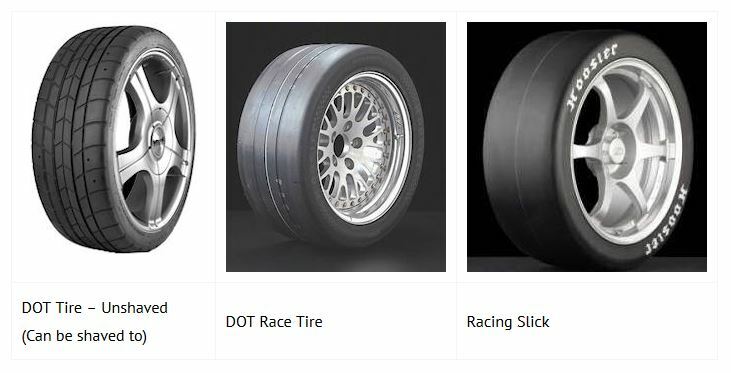 It is still true that the tires have a “sweet spot” and after a number of sessions you will see a drop in performance, but especially for a novice this is not significant. Do you need dry tires and rain tires? Ah, good question, and the answer depends on a few variables. If you are using full tread or shaved tires, these tires typically perform well in light to moderate rain. A shaved tire is just what it sounds like – a full tread tire that has the tread on it shaved down often times to 4/32”. Why do people shave tires? Shaving the tire allows more of the tires’ performance capabilities to be utilized earlier in its life. This process also decreases the tread block depth that ensures there is less squirm, and therefore prevents over heating of the tire. Another factor that will influence your rain tire decision is the climate you will be racing in. Do you live in Seattle, WA where it often rains 160 days each year? If so, your answer might be different than in other climates. There also are tires that are made specifically for pouring rain conditions, and due to the tire’s very soft compound can’t be used when the track is only damp – the track has to be very wet. When I walk around the paddock at tracks in New England, I see many people that have this type of tire. I also see that the majority of these tires have never been used and are beginning to dry rot. If you are not using a full tread or shaved tire, then buying a set of intermediate tires that could be used in various rain conditions as well as on a dry track might make sense. Another possible way to obtain tires is to visit the tire vendors at a racing event. 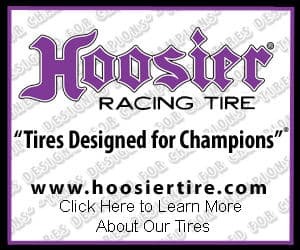 Often times for larger clubs such as SCCA and NASA, tire vendors such as Hoosier and Goodyear will be at the track to sell and mount tires. Even if you decide not to race with either of these clubs, it just might pay to attend a race as a spectator (besides the event being fun and a learning opportunity). After the vendor takes off the used tires, most customers have the vendor dispose of the tires. To the vendor this means that they need to load the used tires onto the truck, unload the tires back at their shop, at some point bring them to a recycler and typically pay a small fee to dispose of each tire. Ask the vendor if they have any used tires you might be able to have. They will often be more than happy to give these tires free of charge. It is amazing what some people consider junk tires! Although you won’t want tires that are flat-spotted, a tire that may be half of a second slower than a new tire would be great for you. Of course you also can’t beat the price. So you see some cool, extremely lightweight used rims for sale. While someday this might make sense, you need to determine if it is fits into your initial build goals. Was this something that you budgeted for? If not, stop your drooling and do what is right for your budget so you can get out on the track and race. Depending on your needs, you may not even need to replace the rims currently on the car. If you determine that you do need an extra set of rims, take your time to locate some inexpensive rims that will fit your needs. A few questions you need to answer are: what is the maximum width rim you can use, what diameter makes the most sense, and what offset or backspace will work for your requirements? Oh, what do these terms mean? Offset is the distance between the mounting surface face (the part of the wheel that contacts the car’s hub when you attach the wheel) and the center of the rim. If the wheel mounting surface is further from the outside of the rim, it has positive offset. If it is directly in the middle of the rim, it has zero offset. If the wheel mounting surface is closer to the inner part or brake side of the rim, it has negative outset. Backspace is the distance from the edge of the wheel to the hub mounting surface. To measure backspace, you would lay an object that has a straight-edge across the inner (or brake side) of the rim, then measure the distance from the hub mounting surface to this straight edged object. Prior to purchasing rims, see if it is possible to take one on trial, and return it if it does not fit properly. This would be ideal. I purchased a set of used VW rims that were very light and inexpensive, and had the rims shipped to me. When I went to verify that they fit properly, I realized that the car’s wheel studs were not long enough to accommodate the rims. Doh! I then had to order longer studs, which for my car cost me approximately $100, not including labor to install them. If you go to a salvage yard, they often have books that will tell you which models and makes have rims that will fit your car. I have also seen some similar resources posted on the Internet. And again, you can always ask other people who race the same car what they are using.